At about 12:50 AM on Tuesday, February 5, 2019, officers assigned to District C-6 (South Boston) made an onsite arrest and recovered live ammunition during a traffic stop in the area of 11 W. Broadway Street in South Boston. While on patrol in the above area, officers discovered a motor vehicle operating with an expired registration and conducted a traffic stop. During the traffic stop, officers spoke to the operator who stated that he had recently purchased the vehicle and had not registered it. At this time, officers notified the operator and the passengers that the motor vehicle was going to be towed for the expired registration and attached plates. A search of the vehicle led officers to discover a Glock magazine containing six rounds of live ammunition located under the passenger's seat. The operator was subsequently taken into custody. Officers arrested Victor Pimentel, 22-years-old, of Brockton. Pimentel is expected to be arraigned in South Boston District Court on charges of Unlawful Possession of Ammunition and Unattended Ammunition. PARADE ROUTE: In anticipation of the New England Patriots Super Bowl LIII Victory Parade which is scheduled for Tuesday, February 5, 2019, community members are asked to please take note of the following street closures and traffic advisories. The parade is set to step off at 11:00 AM on Tuesday from the Hynes Convention Center. Posted parking restrictions will go into effect at 12:00 AM on Tuesday on the streets listed below. Road closures for the parade route will go into effect at 9:00 AM on Tuesday. The parade route is Boylston Street (at Hereford Street), left onto Tremont Street to Cambridge Street, ending on Cambridge Street at Boston City Hall Plaza. Police Commissioner William Gross reminds everyone attending Tuesday's parade to dress accordingly for the forecasted weather (sunny with temps in the 50s) and encourages the public to leave backpacks and large, bulky items and luggage at home. Because both vehicular and pedestrian movement along the route will be limited, parade goers are asked to prepare and plan accordingly. As always, BPD encourages those attending to take public transportation and allow extra time for travel and commuting. Commissioner Gross also reminds parade-goers that this is intended to be a family-friendly event; therefore, there will be zero tolerance for public drinking. Moreover, there will be zero tolerance for any fans seen throwing objects to or at individuals riding on the Duck Boats. In the best interest of public safety, there is no climbing on top of bus vestibules, mailboxes, rooftops, etc. *** NOTE: Towing in restricted areas will begin at 6:00 AM on Tuesday morning. Streets will re-open to traffic after the parade has passed. Streets will re-open on a rolling basis as the crowds disperse and clean-up is completed. Boylston Street is expected to be the first street to re-open, followed by Tremont Street and Cambridge Street. The men and women of the Boston Police Department would like to thank all who celebrated The New England Patriots sixth Super Bowl victory. As revelers took to the streets to share in their excitement, the BPD is proud to announce that only one arrest has been made during the celebrations. Officers arrested Vincent Bredice, 21-years-old, of Los Angeles, CA. Bredice was taken into custody at approximately 11:30 PM on Sunday, February 3, 2019 in the area of Tremont Street and Avery Street after officers observed the suspect climbing a tree in Boston Common. The suspect was advised multiple times to climb down off of the tree, but the suspect gave officers the middle finger before continuing his ascent up the tree. The suspect kicked multiple branches off of the tree while drinking an alcoholic beverage. The suspect eventually was removed from the tree and taken into custody. Bredice will be arraigned in Boston Municipal Court where he faces charges of Malicious Destruction of Property, Disturbing the Peace, and Drinking in Public. At about 12:57 AM on Sunday February 3, 2019, officers assigned to District C-6 (South Boston) arrested four suspects on multiple firearm, drug and motor vehicle related charges after performing a traffic stop in the area of 870 Massachusetts Avenue in Roxbury. The officers were on patrol in the area when a query of the suspect motor vehicle registration revealed it have been reported stolen. Officers stopped the vehicle and removed the operator and the front seat passenger, both identified as 17-year-old males from Jamaica Plain, as well as the two rear seat passengers, Keyon Roberson, 18, of Dorchester and Ivan Andujar, 19, of Dorchester. All parties were placed in custody without incident. Prior to towing the recovered motor vehicle, officers located and seized a loaded .380 caliber Ruger LCP firearm and large plastic bag containing several smaller plastic bags of crack cocaine. Keyon Roberson and Ivan Andujar will appear in South Boston District Court on charges of Unlawful Possession of a Firearm, Unlawful Possession of Ammunition, Possession with Intent to Distribute Class B Drugs and Receiving Stolen Motor Vehicle. The two juvenile suspects will appear in Boston Juvenile Court on charges of Delinquent to Wit: Unlawful Possession of a Firearm, Unlawful Possession of Ammunition, Possession with Intent to Distribute Class B Drugs and Receiving Stolen Motor Vehicle. Officers, attorneys, and youth separated into small groups where they discussed different aspects of the law relating to police interaction. This activity provided young people with a safe way to share their questions and concerns about working with law enforcement. BPD in the Community: The BPD Celebrates 2019 Lunar New Year! On Friday, February 1, 2019, Sergeant Dunford, Deputy Chin and Deputy Colon celebrated the 2019 Lunar New Year. Joined by local seniors, the BPD took part in the festivities at the Rainbow Adult Health Care Center in Dorchester. The men and women of the BPD would like to wish a Happy Lunar New Year to all! BPD Photo of the Day: On Wednesday January 29, 2019, members of the BPD challenged students to a game of basketball at the Saint John Paul II Catholic Academy in Dorchester. Proving the importance of the home court advantage, the younger players prevailed by a two-point margin over some of Boston’s Finest in a game that saw plenty of smiles from both teams. On Tuesday, January 29, 2019, The Justice George Lewis Ruffin Society held a reception in honor of Boston Police Commissioner William Gross. The Ruffin Society works to build a better relationship between minorities and the criminal justice system and was founded 1984 in response to dwindling numbers of minority police officers in the Boston Police Department. Its goals are to create greater understanding and communication between minority communities and the criminal justice system through annual convocations, events, courses, workshops and "The Long Road to Justice" traveling exhibit which documents the history of African Americans in Massachusetts. 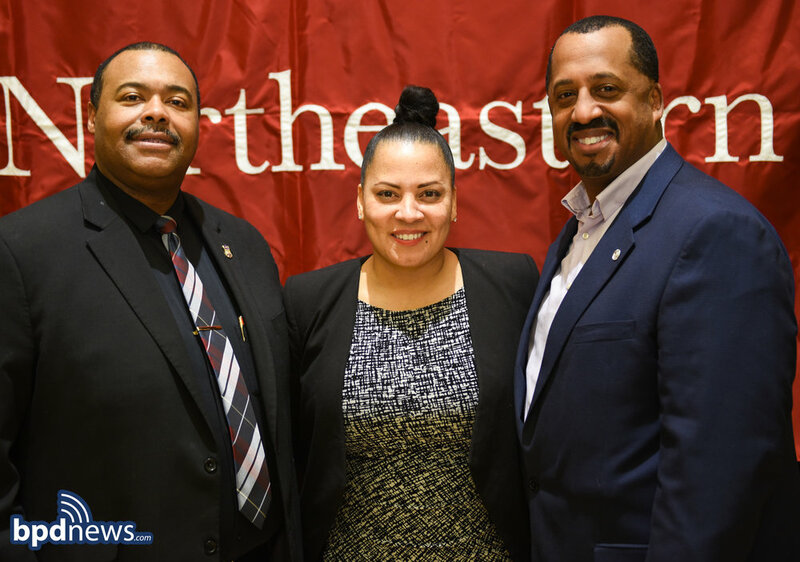 Suffolk County District Attorney Rachael Rollins, Cambridge Police Commissioner Branville Bard, Director of The John D. O’Bryant African American Institute, Richard O’Bryant and a host of others were on hand to enjoy the celebration.